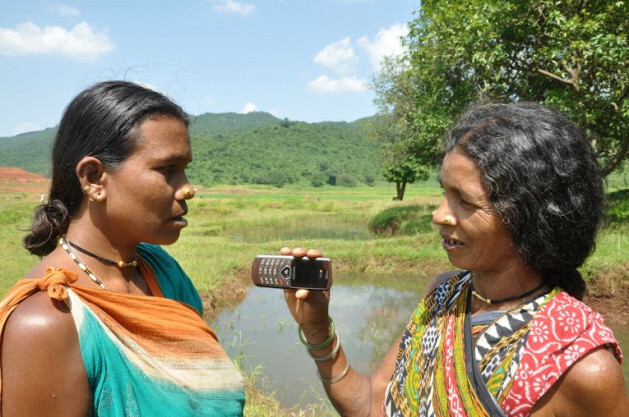 Tribal women from Chattisgarh in India record a message. Credit: Purushottam Thakur/IPS. RAIPUR, India, Nov 23 2013 (IPS) - Deep in the forests of central India live the Gond tribals, an almost forgotten lot, neglected as much by the state as by mainstream media. Many cannot read or write. But thanks to a new technology, and the rapid spread of mobile phones through India, they are now picking up their cell phone and making their voice heard. A tele-news platform called CGNet Swara is helping change their world. Ask Naresh Bunkar, a 38-year-old tribal in Chhattisgarh state who has used it time and again. “Computer mein chhappa jata hai” (“It gets typed on the computer”), he tells IPS proudly in Hindi, pointing out how CGNet Swara helps news spread through the Internet. Through it, tribals air their grievances, share news and get administrative work done – all for free. “I don’t need to pay one paisa for it,” says Bunkar, a field leader of sorts for tribals in the area. It was through CGNet Swara that he first reported how a forest ranger had taken a bribe of 99,000 rupees (1,000 dollars) from 33 tribal families while promising them land deeds under India’s Forest Rights Act (2006). The news was circulated, and two months later he called again to say that the official had returned the money and apologised. In another example of CGNet Swara’s influence, a teacher who had stolen school money, classroom furniture and food grains given by the government for tribal children was suspended after a report on his misdeeds was aired on the network. Encouraged by such success stories, tribals have swiftly embraced CGNet Swara, which literally means ‘Chhattisgarh’s voice’ through the Internet. Started for the central Indian state, where 32.5 percent of the population is tribal, it is fast spreading to other parts of this vast country to reach out to areas that were beyond the pale of modern communication. “While Indian states got divided on linguistic lines, the Gonds of central India were forgotten,” Shubhranshu Choudhary, a former BBC journalist, told IPS. “They don’t have a newspaper in their native Gondi language, but the only new thing I have found on my return here is that most people now have cell phones,” he says. Choudhary used that cell phone knowledge to set up CGNet Swara in 2010. The system operates in a region beset with Maoist insurgency. Its inhabitants often find themselves caught in the crossfire between the guerrillas and state forces. A native of Chhattisgarh, he says the ferment in the region stems from years of neglect. Here’s how it works. When a tribal dials the number +91 80 500 68000, the message goes to a server in Bangalore. The caller disconnects and waits. Within seconds he receives a call and a recorded voice tells him to speak after the beep. The server has been set up by Bill Thies, a self-confessed geek from the Massachusetts Institute of Technology (MIT) working at Microsoft’s Research Laboratory in India’s IT capital Bangalore. Using a simple desktop and modem, Thies used a freely available software called Asterisk to build 10 lines that automatically call back ‘missed call’ numbers and then record a two-minute message from the caller. The ‘secret ingredient’ is the unique media networking system set up by Choudhary, whose community interests aligned with Thies in user-generated technology. ‘Swara’ now has 400 callers daily, dialling Thies’ server in Bangalore to either listen to or record their own news. Each message goes to the moderator, Choudhary, and through him to about 50 strategically located volunteer sub-editors for cross-checking of facts and local follow-up. The volunteers are educated Indians, well-versed in their spheres of work and residence, coming from a web-based Yahoo group called CGNet, set up in 2004 by Choudhary and journalist Frederick Noronha of Goa. For instance, Bunkar’s message on the forest official’s bribe demand was first checked by CGNet’s locally based editorial volunteers for accuracy. It was then sent to the principal chief conservator of forests who found the allegation to be true and suspended the official. The network – with the website – has even helped people access a popular rural job guarantee scheme. The state government, however, seems reluctant to acknowledge its potential as a parallel system of governance. “I personally find it an effective source of feedback and grievance redressal from the grassroots. I do make use of it off and on,” Chhatttisgarh Chief Secretary Sunil Kumar, the state’s top bureacrat, told IPS, taking care to emphasise the non-official nature of the way he uses it. Choudhary calls the network a kind of ‘citizen journalism’ wherein there is local news for local residents who are otherwise neglected by the mainstream media. CGNet Swara now covers all of Chhattisgarh. It’s also popular in the nearby states of Madhya Pradesh and Jharkhand. The news system has spread by word of mouth to the tribal belt across Gujarat, Rajasthan, Odisha, Jharkhand and Andhra Pradesh – an area Choudhary calls the ‘media dark zone’. Ironically, the region’s ultra-left Maoist radicals, who claim to fight for the marginalised, have issued threats to Choudhary, asking him to close down CGNet Swara. Choudhary, who divides his time between Delhi and Bhopal, says the Maoists are threatened by the concept of self-empowerment that the news system has brought to its users. CGNet Swara is evolving into a radio system using a free medium-wave bandwidth, and Choudhary believes users will pay a small amount for subscribing. Running on a UN Democracy Fund and Knight Fellowship finances so far, the system is now looking for financial independence. A health consultation network called Swasthya Swara is also being set up where traditional healers who make use of herbal medicines will be on air. And, for the unempowered tribal population of India, whose numbers run into tens of millions, that’s indeed good news.